A total of 922 hand-set, finest-quality Top Wesselton diamonds, precious sapphires in various colors, and exquisite rose and white gold: the Pathos Swan is a classic example of Carl F. Bucherer’s expertise. A total of 922 hand-set, finest-quality Top Wesselton diamonds, precious sapphires in various colors, and exquisite rose and white gold: the Pathos Swan is a classic example of Carl F. Bucherer’s expertise. For the watch not only is a mix of choice materials but also embodies watchmaking skill and the art of the jeweler at the highest levels. 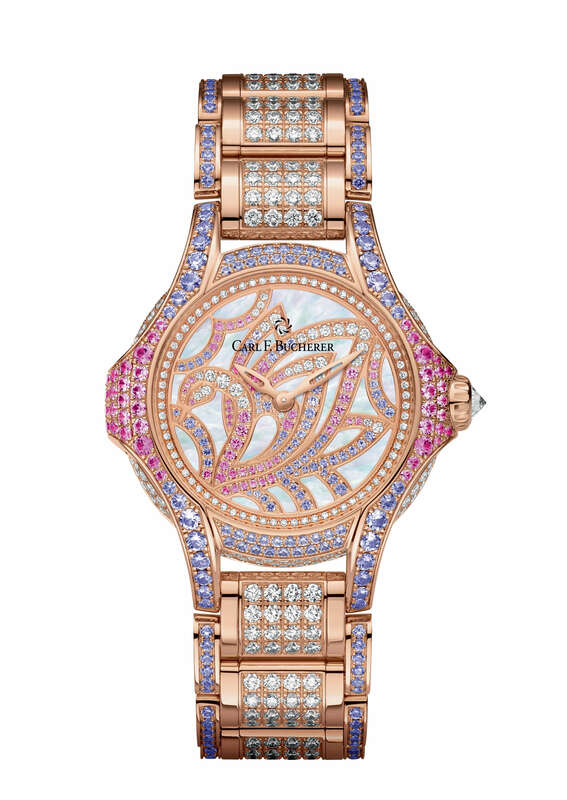 The name Swan is, therefore, more than appropriate for this extraordinary timepiece, especially since so many cultures revere the bird as a symbol of purity, grace, and beauty. As to be expected in a watch of this quality, every single detail is lovingly designed, from the slender hour and minute hands to one of the characteristic features of the Pathos, the aureole. Exquisite stones set along its entire length underscore the aesthetic appeal of the case. The Pathos Swan is a highly exclusive timepiece that is available in two models: unicolored, with a case and bracelet in 18 K rose gold, or bicolored, in a combination of white and rose gold. Both models are limited to just 88 examples and made exclusively on request in Carl F. Bucherer’s workshops.